You may have heard that rush immunotherapy or cluster immunotherapy is a way to get control of your allergies more rapidly, with less of a time commitment down the line. What are these procedures, what are the advantages and disadvantages, and when are these alternative approaches most beneficial? What do you need to think about to make the best decision? Immunotherapy, or allergy shots, offers the only potential cure for allergic rhinitis, allergic conjunctivitis, atopic dermatitis, allergic asthma and venom allergy. Unlike medications that simply cover up allergic symptoms, allergy shots are the only therapy to change how a person’s body deals with allergies. You would think, therefore, that everyone would want to do allergy shots. Unfortunately, allergy shots can be inconvenient for many people because they involve a significant time commitment (typically going to the allergist’s office once to twice a week initially), and may take months before they start working. Rapid build-up (accelerated) schedules for allergy shots are used by some allergists in order to achieve a higher dose of allergy shots faster, which results in the benefit of the shots sooner. These schedules also result in a person getting to a “maintenance dose” faster, as well as being able to come into the allergist’s office less often for allergy shots once this maintenance dose is achieved. There are two types of rapid build-up schedules—rush immunotherapy and cluster immunotherapy. Rush immunotherapy involves giving a person multiple allergy shots over a period of many hours to days, achieving a maintenance dose in a very short amount of time. Most often, increasing doses are given every 15 to 60 minutes over a period of one to three days in the beginning and then increased rapidly to get to maintenance doses. Rush immunotherapy allows people to get up to maintenance doses of their allergy shots much more rapidly. This is often reached in a period of six weeks. In contrast, with conventional allergy shots, people usually receive single doses once or twice a week and it can take three to six months to build up to maintenance doses. After the initial period of rush immunotherapy, a person is able to come into the allergist’s office typically only once a week for the next many weeks, then even less often. People undergoing rush immunotherapy also achieve benefit from allergy shots much faster, usually within a few weeks. 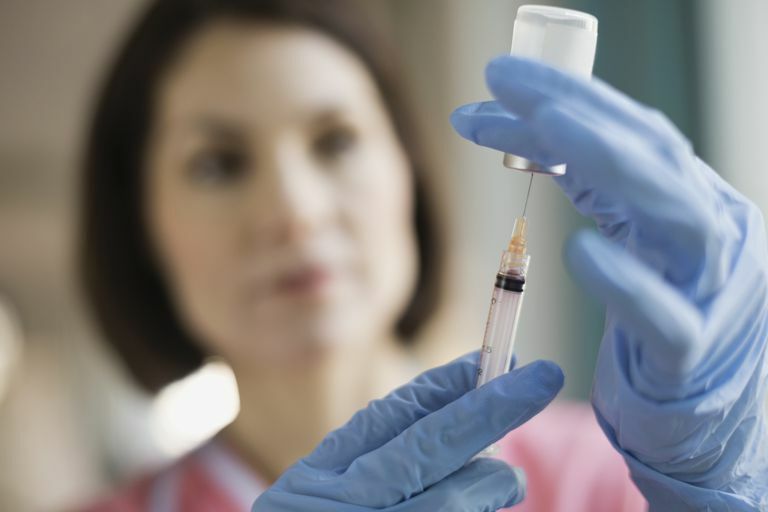 The benefit with standard allergy shots can take much longer, with benefits usually beginning around the time in which maintenance doses are achieved. Rush immunotherapy is commonly used for people with venom allergy (bee sting allergies and ant sting allergy.) This allows for quicker protection against allergic reactions to future insect stings, and may actually be a safer way to treat people with venom allergies who have had a problem with allergic reactions to their allergy shots. A 2016 study found rush immunotherapy to be safe and more efficient for venom allergies in children. Over the long run, rush immunotherapy may also be more cost-effective. Unfortunately, rush immunotherapy results in allergic reactions in a large percentage of people, so various medications (such as antihistamines and corticosteroids) are often given in order to prevent or minimize these reactions. A person undergoing rush immunotherapy should be prepared to spend at least a couple of days in the allergist’s office, receiving many allergy shots over this time. Rush is more of a time commitment up front, typically taking a full day or more, while it often decreases the time commitment later on. Rush and cluster immunotherapy offer an alternative to traditional schedules for allergy shots, allowing a person to achieve higher doses of allergy shots much quicker, and therefore get benefit sooner. However, rush immunotherapy probably results in an increased rate of allergic reactions. Rush is more of a time commitment up front, typically taking a full day or more, whereas it can be a time saver later on. Often, allergists have typical ways of giving allergy shots to their patients, and they tend to offer a standard build-up style to all of their patients. Most allergists don’t give their patients the choice of build-up schedule. If you are interested in pursuing one of these rapid build-up schedules, contact several allergists in your area to find one who is experienced in these procedures. Confino-Cohen, R., Rosman, Y., and A. Goldberg. Rush Venom Immunotherapy in Children. Journal of Allergy and Clinical Immunology. In Practice. 2016 Nov 30. (Epub ahead of print). Cox, L. Advantages and Disadvantages of Accelerated Immunotherapy Schedules. The Journal of Allergy and Clinical Immunology. 2008. 122(2):432-434. Fan, Q., Liu, X., Gao, J., Huang, S., and L. Ni. Comparative Analysis of Cluster Versus Conventional Immunotherapy in Patients with Allergic Rhinitis. Experimental and Therapeutic Medicine. 2017. 13(2):717-722. Perez-Rangel, I., Rogriguez Del Rio, P., Escudero, C., Sanchez-Garcia, S., Sanchez-Hernandez, J., and M. Ibanez. Efficacy and Safety of High-Dose Rush Oral Immunotherapy in Persistent Egg Allergic Children: A Randomized Clinical Trial. Annals of Allergy, Asthma and Immunology. 2017. 118(3):356-364. Winslow, A., Turbyville, J., Sublett, JW., Sublett, JL. and S. Pollard. Comparison of Systemic Reactions in Rush, Cluster, and Standard-Build Aeroallergen Immunotherapy. Annals of Allergy, Asthma, and Immunotherapy. 2016. 117(5):542-545.